I've accumulated a fair amount of bioinformatics and clinical informatics experience in the interest of reducing the cost of useful discovery. I feel this is particularly achievable in the realm of integrating clinical care data into trials for clinical research, efficacy monitoring and biosurveillance. I would like to continue developing an infrastructure which democratizes innovation and brings high-quality clinical care to everyone. Work product will include examples, tests and navigable specification. language extension for references by label ("backtick"). validation by SPARQL query ("remote-query"). Extended Shape Expressions execution environment to include support for manifests. Extend the Shape Expressions language to meet FHIR profile use cases. Aid in developing bidirectional mapping between OMOP and FHIR clinical resources. Parse DOD clinical MUMPS data and transform it to FHIR/RDF. Facilitate consensus on the FHIR/RDF standard. Capture concept maps developed or approved by submission reviewers, e.g. <http://www.w3.org/2013/12/FDA-TA/doc/RenalTransplantation-cmap>. Detect smaller safety and efficacy signals in submitted data. Share concepts and structures between therapeutic areas. Leverage current clinical terminologies like SNOMED-CT, LOINC, UMLS/EVS (oddly, no MedDRA). Leverage Semantic Web languages, tooling and ontologies, e.g. BRIDG. See my W3C People Page for a more complete list of projects. The role of W3C Team Contact involves assisting W3C Working Groups with the standardization process, including consensus-building and document publication. In addition to secretarial/diplomatic tasks, the Team Contact provides continuity with other W3C standards and contributes technically to the Working Group products. ISO 11179 practices implemented in RDF — for consideration of the applicability to RDF. with Charlie Mead, strawman Disease Model for FDA (Protégé class hierarchy). Scripted import of data into RDF. Developed SWObjects library to support HCLS IG needs. 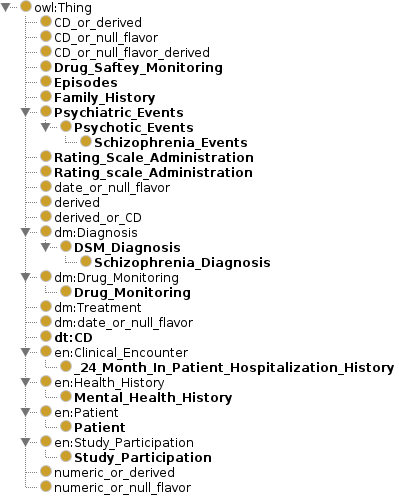 Ported anonymized patient records to RDF. Edited and coordinated documentation on the HCLS KB. Organized RDF Validation Workshop (see Workshops organized below). Developed and specified the Shape Expressions language. Created an online demo for outreach Shape Expressions. Chartered, initiated and participated in a W3C Working Group. Wrote the Direct Mapping of Relational Data to RDF specification. The Direct Mapping specification reflected an implimentation for HCLS in SWObjects. Validated and contributed to the test suite. Wrote the SPARQL Federation specification. Implemented all of SPARQL 1.1 in SWObjects. Provide RDF modeling of web service descriptions and their annotations. Developed SPDL (below) use case for SAWSDL. Prototyped each of the candidate query languages. Developed yacker (below) to prototype grammar alternatives. Edited and coordinated publication of the four SPARQL W3C Recommendations. Defined interactions between SPARQL Query and XML Query/XPath. General RDF modeling and consulting. I18N and web architecture consulting. Extended MySQL 6.0 with SPASQL, a dynamically loadable SPARQL parser. Developed SPARQL Federation Use Case to test SPASQL implementation. Working with a student to maintain the SPASQL code. Worked in a small team, mostly self-directed, formulating semantic web scenarios and developing tools. Developed a library for RDF and semantic web development. Built RDF manipulation tools, including a query interface and visualizer. Designed and built ephemeral and persistent RDF databases. Researched and implemented transformations between RDF query and relational databases. Implemented W3C's Annotations and Bookmarks servers to enable users to add markup and classification to web resources. Debugging and feature contribution to Apache httpd. Contributor to miscellaneous other open source projects, .e.g MySQL. Promoted use of W3C standards through education and community outreach. Organized XML Protocol activity BOFs (Birds Of a Feather sessions) and working group charter. Participated in and presented at several RDF and semantic web conferences. Encouraged different communities to use W3C recommendations to solve their problems. Worked with Henrik Frystyk Nielson to develop W3C's reference library libwww. Re-engineered libwww to prototype the HTTP/1.1 protocol. Ported green-threaded select-based library to MS Windows NT. Reworked event model and logging facilities for better configurability. Developed libwww into a portable, competitive product. Benchmarked HTTP/1.1 speed and network use improvements. Created yacker; a tool that writes parsers for an EBNF grammar. Administration of Unix servers (Linux, Solaris) to meet communications needs of a global team. Maintenance and administration of w3.org, the world's oldest and longest-running web site. Development and maintenance of web tools and services (such as the W3C Access Control System, which manages access for 100k group memberships for 35k principles to 1m distributed resources). Rusty on various assemblers, Pascal, Fortran. Most comfortable with emacs on a Debian or Ubuntu Linux system. Experience in CGI & Perl and PHP3/4 programming. Administration and programming of Lotus Notes databases (rust). Translating standards into practice – One Semantic Web API for Gene Expression, J Biomed Inform. 2012 Aug;45(4):782-94. Bachelor of Science in Mechanical Engineering received in February, 1992. Concentrated on computer applications in engineering. Taught a senior level course in how to select, use, and challenge the results of available tools. I taught this course because it was pointed out to me that in many realms, computer-aided was being replaced by computerated (uninformed mis-application of computers). Français: je me debrouille assez bien. 日本語: comfortable with tools to read and write kanji; can barely utter a word. Comfortable with use of other scripts within emacs, e.g. Korean, Russian.